Bounce Better than Banzai in Low Wind? What’s the correct boom length on for Banzai X? Can I add 303 uv protection to the sails? Is my Banzai Rigged Right? Will Banzai work on Gaastra Mast? Need Smaller Than my 4.0 Banzai. Which One is Right for Me? Replacing Naish Force with Banzai? Low End on Guru G4 Similar to Banzai? The Banzai Flip Faster than Eclipse? How do I reduce travel weight with Eclipse Quiver? Are Neil Pryde or Ezzy Masts OK? Save Money on Masts – Will One Work for my 4.0 and 4.5 Banzai? Goya Sails Really Have Better Low End? 2014 Banzai or 4-Batten Guru? 5.7 Eclipse or 5.7 Banzai? 2014 Banzai or 2014 Guru? What’s different about next year’s Banzai (2013)? Are the Wrinkles in my Banzai OK? Can I trim my 2013 Banzai to be less grunty? How will the new Banzai perform with a new 84 Liter Goya Thruster? Does My Banzai Need a Softer Mast? Will banzai work better than eclipse in stronger winds with more emphazis on comfortable ride and jumping than wavesailing? Should I change from Eclipse to Banzai? When will the Banzai be available? Can smaller Banzai really replace my 5.3 Eclipse light-wind-machine? Can 2012 4.9 Banzai replace my 5.7 Eclipse? How’s the Banzai for Jumping? More just a riding sail or would it be good for jumping weather as well? How is Banzai positioned vis a vis Guru & Eclipse? What are the Specs on the Banzai? What is right quiver range for the Banzai? What Banzai range do you recommend to replace my 3.7m-5.2m Ezzy Wave Panther range?? What’s the deal with the 4.9 Banzai and its feel? Do you know when the Banzai might be available in the UK? QUESTION Is the Bounce 5.4 is better for low wind or the Banzai 5.3? What do you think, rather Bounce? ANSWER Bounce will pull high, up, tending to really “stand up” a rider (onwards to catapult possibly), so best be aware there. But yes, if you’re ready for it, really awesome light wind pop,,, lovely light rig weight. Banzai can deliver the power from lower- (a bit more pre-twist), which is a very neutral/forward/ driving- not as “up” as Bounce. You can also rig it like Brawzinho which is really minimal downhaul- like leech loose halfway to downhaul dot- not all the way like recommended. Tune outhual from there. The sail set like that becomes really elastic, and feeling more like Bounce. The boom size according to the chart (also on the sail and the bag) is 170/157 but when I tuned my sail I needed to make the boom 176 (with mast ezzy skinny 400 and extension of 30), is it a mistake? should it be 175/170? Glad to hear the Banzai X 5.5 is working well for you! Most often what is happening with a boom that appears too long is that the dimensions marked on the boom will not be accurate. It’s really common actually…,,, sometimes the difference between the printed and the actual boom length can be up to 3-3.5cm. Also depends a bit on the mast- if it is a bit softer (not uncommon) that can add a cm or so to the length. Question: I just bought a new 5.0 and a 4.5 banzai pro from Pascal @ xmas and i want to know if its a good idea to add some 303 uv protection to the sails ?. Will i hurt the sails by doing this. I have not used the sails yet. Probably not a good idea just wondering. Thanks for your mail and inquiry. I have no experience with add on uv inhibitors, sorry. Sails already have really pretty good uv durability,,, I mean, as long as you keep the sails out of the sun when you aren’t using them, they should last a long time. On the other hand, Sails left rigged or left in direct or even indirect sunlight, consistently, will degrade pretty quickly,,, so unless you are OK to replace your sails yearly, I don’t recommend subjecting the sails to this level of exposure. Goya mast 90% 400 2014. When I rig the sails. the sail would be on one side all the time. I Can push it, but jumps back to the other side. Answer by Jason Diffin: Thanks for your mail and your inquiry, and stoked to see that red Banzai 5.3 rigged up on that deck/kid zone!!! The sail looks great in the photos. My first thought was that it looks like the sail needs a bit more downhaul. Maybe 5-6mm more. I want to see that leech a bit looser in the the sail body between #1 and #2, and also more downhaul will de-rotate the battens just a bit from where they are and I think that foot batten looks a touch over-rotated. If the foot batten is over-rotated then it can put a reverse (of intended foil shape) pressure on the tip f the batten and make that S bend I see in the photos. Also, yes, it looks like the sail has a lot of outhaul on it. With the new downhaul setting, release the outhaul to neutral, put 2.5cm of positive outhaul on the sail, and that will be a good setting for nearly every condition you will experience on that sail. My sails tend towards higher downhaul and lighter outhual(full profiles),,, profile gives power, and twist (“open/loose head”) gives range and control. Starting from there, then I recommend adjusting for fine tuning (it’s all in the outhaul). Have you used the sail? How dos it feel for you? Question: Will your banzai work on 100 per cent carbon gaastra mast? Is the Goya sail made for constant curve ? Answer from Jason Diffin: Thanks for your message. I can’t speak directly to how the Gaastra mast will behave,,, I think they tend to be constant curve, correct? I design on more flex top (64.5%/79%) in sizes 370, 400, 430,,, although I tend towards constant curve on 340, 460 and 490. I believe a more flex top in those keys control sizes droves draft low and stable, and also promotes a smooth progressive twist which brings range, rigging range, and a massive range of points of sail that the sail will feel really good in. Question: I have to leave a big thank you for the work that you and your team are doing! I am using Banzais now for a whole season and I can not even describe in words how much they helped me push my sailing no matter if freestyle or waves. It just does such a good job … I don’t need to think about the sail itself while I am sailing, but focus on the waves and have a blast. I first got the 5,7 5,0 4,5 and then i added a 4,0. Yesterday we had a massive day on the north sea with an average windspeed of 39 knots, logo to mast high waves and side shore perfection. So i was pretty stacked on the 4,0. The gusts were so extreme sometimes that one could do nothing but just sail along and wait for it to ease off a bit. Mental! Some guys were on 3.3s some on 3,7s. Dudes with my weight (85 Kilos) and around 78 – 82 liter boards. We are realizing now, that our seasons last longer into the winter and we are getting battled with storms that are actually sailable more often over the last years. Now i am having a hard time figuring out which size to add to my quiver. My first thought was to go 3,7 Banzai. But i don’t know if thats really that much of a big difference to my 4,0. But then i saw another possibility. Since i am using the poly clew a lot to adapt to the conditions could the Guru 3,5 be my match? Thanks for your help, thanks for the stuff i love to ride! Answer: Super cool to receive your mail and thank you for the feedback and the kind words!!! I am super stoked! Cheers Max, please let me know what you decide and how it works out. Also, would love to see a photo or two of your local spot going off!! Your sailas have definitly improved a lot over the last fey years, I am pretty impressed. Maybe for me it is time for a change now. Since last year, i am already using the 2014 QUATRO Pyramid 84 and 92 (with 85kg weight of myself). Right now I am sailing with Naish Force . 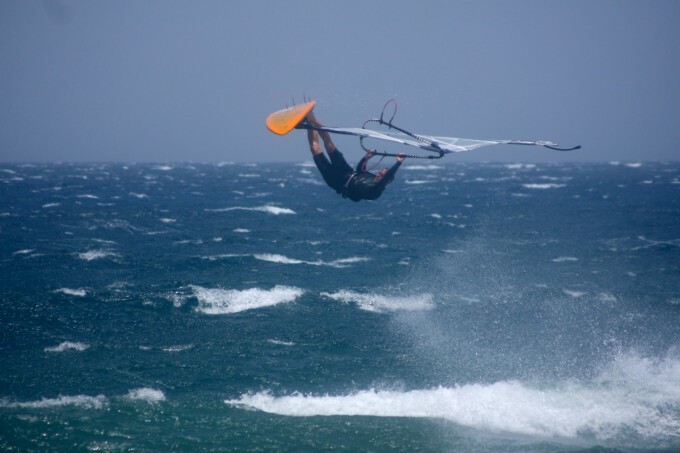 This sail was perfect in high wind or gusty conditions like south africa and my homespot Klitmöller. the I am using the range of 4,2 / 4,7 / 5,3 / 6,2 since aeons . I would like to go now for the 2015 Banzai. As I found out, you recommand choosing the sails x,5m² smaller than normally. Does it mean I should take BANZAI 3,7 / 4,2 / 4,7 / 5,3 instead? Or is the option skipping 3,7 Banzai and taking 6,2 ECLIPSE instead the better choice? Very stoked to receive your mail! Thanks for the kind words. We’ve been working hard these last years, lots of group effort building and testing, and it’s great fun to bring out the results. Thank you for your trust in our brand! At 85 kilos, I am less inclined to recommend that you drop .5 on your sail sizes. For a lighter guy on a very floaty fast board it is more possible, but for you I think it best to stick with the same sizes you have been using. You wil be able to hold that Banzai 4.2 down in a lot of wind. The only time Levi or Brawzinho use a smaller size is if they are in a place like Pozo, or someplace that requires micro sizes. You will find a massive range with your new Banzai sails. You can rig them full for light wind or more neutral and flexible for stronger wind- and 99% of this range is found just by adjusting your outhaul. For that one, I would recommend staying with Banzai and maybe going with 6.0, if you are still looking for maneuverability and lighter handling. If you want max power to get going in the lightest wind possible, then maybe 6.3, although it will require a 460 mast, or if you are using Goya masts then a 460 bottom plus 430 top would cover it. If in that size you are looking for more straight line freeride/freewave type sailing, max power and range, speed, then you would consider Eclipse 6.2 which works on 430. We’re getting used to the forward pull on the sails, most of the guys have gone over the front a few times…. just need to get used to it i suppose. 1. If you could add a ‘loop and go’ downhaul pulley system (kinda like the Naish sails)…. that would be magic and speed up rigging heaps. 2. The mesh pocket for the excess downhaul line tends to get caught on the mast extension ring when you let the tension off. Answer: Thanks for your mail and stoked to hear the gear is working well for you. Also, many thanks for the comments and feedback. I really appreciate that. #1 reason for a forward pitch is not quite enough downhaul. Maybe you and your guys are downhauling enough, but maybe take a closer look next session. Make sure the leech is loose in to he rigging mark, in fact all the way in to the carbon stretch control tendon between the top and #2 batten is best. This downhaul setting is good for nearly all the wind conditions you will encounter on any given size. The open head encourages easy pumping in light wind, and provides easy control in high wind. An open head also minimizes the “pitch” pull in any wind condition. Use your outhaul to tune the power of the sail. Quick loop outhaul on the sail. Yes, that’s an interesting idea. I will keep that in mind. I’ll keep it in mind though, thanks for that. One solution is that after the outhaul is released, then pop the downhaul and unthread it, then grab the boom front in your right hand and the tack fairing rigging handle in the left and pull sharply up on the handle. That should clear the fairing from the mast base/extension. Another solution is to flip the tack fairing up before de-rigging. Question: For my 5.3 BANZAI PRO 2013, can I use a SDM or must the mast be RDM? I have bought today a sail Goya Banzaï pro 2013 (new). I have a mast 4.3m SDM. Can I use this mast for this sail? Answer: Try rigging the sail. If the lower 2 battens, particularly the lowest batten does not clear the mast easily when rotating from tack to tack, then the mast diameter is too large. Please let me know how it goes! Question: I am a relatively light rider 157 lbs and the 84L is definitely floaty for me, so it sounds like the Banzai in a bit smaller size might work for me. This would be my big sail for the board, so low end power is important but again something that would rotate quicker than the 5.3 Eclipse. Also I prefer a less punchy feel so I think I may prefer the newer Banzai design if its more like the 2012 Eclipse. To me punchy is a sail with a tighter leach, like when you rig the Eclipse using the top grommet for more power, to me it feels more punchy or the COE is higher (is this what you mean by lift in the 2012 Banzai?). I would prefer less punchy feel as long as I can get good low end power. I hadn’t thought of the 2014 5.3 Guru maybe a possibility but in terms of low end power would that be similar to the 5.0 Banzai? Answer: 2012 Banzai lift is from more luff curve higher in the sail. COE is up and back compared to 2013/14 Banzai. 5.3 Guru compared to Banzai 5.0 is going to feel softer in the hands, because of construction. A direct power comparison is not easy to answer directly, because it depends on other factors including the ones I explained in my last mail. Question: I have a 2012 Eclipse 5.3 that I normally use on a 85L Quatro FSW but just purchased the 84L Quatro Tempo from Margaret. Testing the board with my 5.3 I noticed the board comes around so quick compared to the FSW that I can’t flip the 5.3 quick enough. Maybe I just need to get used to the board more but I did not notice this with a 5.0 Guru or 4.7 Northwave I tried on the board, so I think it’s the boom length of the Eclipse takes longer to rotate. So question is would a 5.0 Banzai give similar power to the 5.3 Eclipse but rotate faster in the jibe? Any other handling character of the Banzai better suited to the Twin fin than Eclipse? Or do you think a 5.3 Guru would work (I notice boom length is the same for Eclipse and Guru in 5.3)? Answer: Banzai 5.0 (r 5.3) would be an interesting choice, and maybe the best choice. For a very light, playful feel with a lot of lift- the 2012 model year is a good choice, or for a more low gear low end drive and great overall range reminiscent of the Eclipse, the 2013 or 2014 model are cut more traditionally with a low and stable and driving draft. Yes, a 4 batten sail is generally better suited for a twin fin board. A twin fin likes to turn quickly, and the light weight and outline plan of the 4 batten Banzai really pairs well with that maneuverable characteristic the twin has. 2013 and earlier Guru is 5 batten, and 2014 is 4 batten. I would tend towards the 4 here, but know that the Guru will have a more flexible feel from the PVC window, and the outline of the sails makes it turn quickly, and the profile allows you to throw it in to neutral quickly as well. For riders looking for a more direct feel, the Banzai is the choice. Does a new 5.0 Banzai provide the power of a 2012 Eclipse 5.3. If you are very light and your board is very buoyant, then answer swings towards more yes. If you are heavier and less buoyant then more no. Question: At the moment i’m very happy with my 4.2/4.7/5.3 Eclipse Mod. 2012 and the Goya-Masts 3.70 / 4.00m. 4.2 to 5.3 can be covered with 4 Goya mast parts- 370 top, 400 complete, 430 bottom. The 5.3 needs to be taller than 427 (maximum 400 mast + extension) for best performance. Myself, and my competitive riders don’t want to compromise performance in this critical size, and we sell what we ride and believe in. The quality and consistency of our USA made masts allows us to mix and match length sections with confidence, and also to enhance performance characteristics of the sails. Any more questions or comments, please let me know. Question: I’ve sold off some of my Severne Blades in order to change to Banzais. How do you think the 5.7 will compare in power to the 6.2 Blade? I am now (just got it) on the 118L Goya quad. Which looks awesome by the way. I’m about 220 pounds. Our team rider Marcilio Browne weighs a bit less than you and he feels that the largest size he really needs is 5.5, and that was one of the main reasons for producing the size this year. You are a but heavier, and because of that I think the 5.7 will suit you well. Especially with 118. For the lightest of light winds you can also tune the sail accordingly with a bit less downhaul and outhaul to really create the maximum draft and lift possible. Question: Can you give us an advice for buying sails please? First of all, my weight is about 80 kg, my boards are 2 three fin wave, 80 and 95 l ,conditions are side,side-on and onshorewind and waves of max 2 meters. I want to have 3 sails ranging from 15-37 knots. Can i use other mast than goya for example neil pryde or ezzy mast? Answer: Ezzy mast is the closest to the Goya mast in bend. NP mast I don’t know so well. Regarding the sails- choose according to the desired power and feel, not the conditions. All of our wave sails are suitable for any wave condition- the difference is how the sail delivers power and the feeling in your hands. Question: I have 2013 Banzai 4.0 and 4.5 and would like to avoid buying 2 masts. Can I get by with just one? Would a 370 mast and 39 cm extention work for the 4.5? Would a 370 base and 400 extention be better for the 4,5? Would 400 base and 370 work for the 4.0 – and be a better total compromise than the above? Answer: A 370 for the 4.5 will make the sail soft and probably a bit unstable. Best choice would be a complete 370 for the 4.0, and then a 400 bottom (plus 370 top) for the 4.5. That will work very well. When mixing mast lengths, make sure that the longer section is always on the bottom. Scroll down to the “Pro sails mast guide” and all the info you need is right there. Question: Tell me the truth about if a 4.7 Goya is almost the same than a 5.0 of another brand. I mean, not dimensions, but power or other items. Then it´s a good deal for me to get 4.7 as my biggest sail. Is new Guru as powerful as Banzai? Answer: I can’t speak directly about any other brand, but I can say that my sail designs have really good low end power. Also, there is a lot of people these days asking me “Is it really a 4.7?” and I say go ahead and measure it. The sails are the size they say they are. The improved low end comes form the light weight of the rig, and also the fact that we all tend to be riding higher volume boards. 4.7 as your biggest sail could work- but as long as you have enough volume under your feet, and a clear vision about what you expect from the 4.7- yes it will get you moving in light wind, but if your primary goal is planing, then maybe you need to upsize a bit. If your primary goal is to just get around and then catch and surf waves, then it’s achievable. Question: For whom is the 2014 4-batten Guru best suited and for whom the Banzai? Answer: Some people prefer a sail with a little softer “clutch” feeling in to power engagement. PVC window, surrounded by X-ply, gives Guru that sensation compared to a monofilm window which tends to deliver the power more explosively. This softer power engagement means that the sail feels forgiving in gusts, and less fatiguing overall because of the smoother ride. 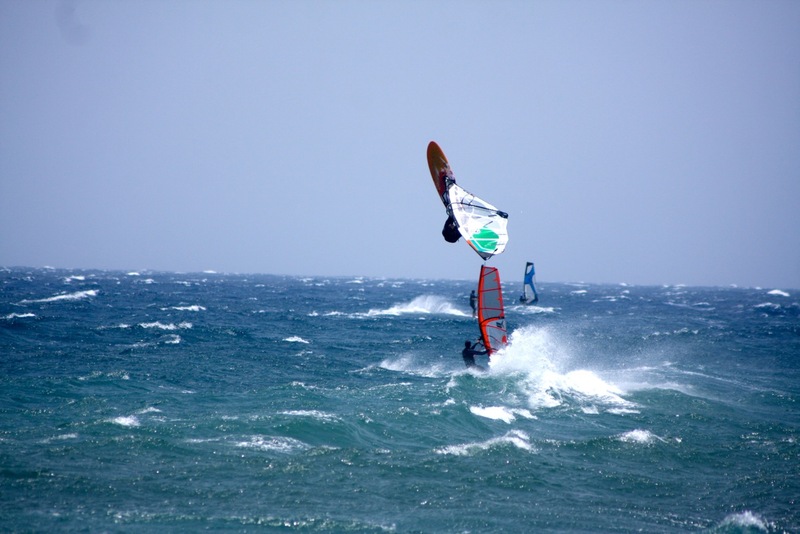 Sailors of smaller stature (male or female) tend to like this, and also sailors of any size who sail in conditions where comfort and control in strong winds, and the ability to throw some aggressive jumps hard turns is the focus of their session. One more thing about Guru is that there are sailors out there who don’t want monofilm because once it starts to rip it it usually tears the span of the panel, whereas the Guru PVC window is nearly impossible to tear, and the surrounding materials are all rip stop in nature as well. Last thing- the PVC window stays very clear over the life of the sail. It’s very cleanable, compared to monofilm which tends to dull and become opaque over time. QUESTION: I’m seriously thinking of ordering a 5.7 Banzai this weekend. Do you think I could replace my 5.7 ecplise with this? What I was thinking was just using the Banzai for super light wind gusty days to make use of its get up and go then revert to the 5.7 Eclipse when the wind picks up to make use of its higher top end and stability. A 6.1 Banzai would indeed make a very interesting proposition…. ANSWER: I think the 5.7 Banzai would be a great replacement for the 5.7 eclipse for you, your board and your target conditions. Please let me know how this goes Adam, I’m very interested in your feedback here. QUESTION: I almost finalized my Pre-Order with Ralph for summer 2013 with G4 in the size 4,2; 4,7; 5,3. I belief this will be fantastic sails for me. FYI: I like sideshore wave sails with huge windrange – like Gaastra Manic which I used earlier. But for the big 5.?? size I´m undecided and would need some advise, since I don´t know the influence of your latest design amendsments of Banzai & G4. 1. I loved the G4-4,5 prototype that I tried November in Maui, but is the G4 in size 5,7 the right sail for me @ 20-26KN low wind Wave action? 2. From my Maui Test sessions I had the feeling that B-2013 in 5,3 could be used at pretty much the same Windrange like G-2013 in 5,6. How did the G4 & B-14 change influence in wind range of the sails? Which sizes are for similar use? 3. What I disliked most on last B13-5,3 was the continuous demand in handforce, even while slugging. Is there a change in that feeling with B14? ANSWER: Thank you for the mail, and for the great questions. I really like the new Guru G4 5.7. Compared to older pvc window 5 batten designs, it’s really a lot lighter in the hands and has a really nice full power delivery without being too hard or heavy. 2014 Banzai 5.5 is also a very interesting choice… maybe the best choice if you really want the largest size you carry to be a dedicated light wind weapon. Yes, the handling of the ’14 Banzai sails is much improved over ’13 with lighter material in the leech (weight and flex) and lighter material through the luff panel (lighter, but more about the lively flex it brings). Also the outlines of the sails have been tuned to make the sail feel more forgiving in the pull rather than pull like a tractor. Banzai holds the line as a monofilm window power wave sail with improvements in feel and comfort handling, while Guru G4 is introduced to offer a softer, more neutral feeling for sailors looking for that sort of more relaxed feel in a no monofilm construction sail. I hope this info helps Frank! Question: We definitely enjoyed the bonus season…light crowds, great swell and wind. Even more enjoyable on your excellent 2012 sails. Loving the 4.5 Eclipse and take every opportunity to use the 4.9 Banzai…it really made 5.0 conditions fun again for me! I know you advise small Banzais on big boards, but the 4.9 works just great on the 75 LS Quad thanks to its light weight and stability. What’s different about next years Banzai? Construction- addition of 3 mil scrim/Kevlar X perimeter paneling for overall strength and leech edge stability. Handling 2013- The draft is lower and more forward compared to 2012. The sail drives forward, compared to the ’12 which lifted the board more with a high “back bubble” feeling that really feels quick and light and playful in the low to mid range of the sail. The ’13 sails are much rangier overall, and with the full low draft, they have at least as much low end power as the ’12 sail, just in a more direct driving way. It’s interesting because the Banzai really changed a lot from ’12 to ’13. ’13 isn’t a refinement as much as a basic re-design of the sail. Working with our new team rider Marcilio Browne (6’2″, 195, 0 fat content) I really needed to make the sals power up solidly and manage a huge wind range without the profile coming apart in the hands when too overpowered. So that’s the new Banzai. A really great thing about the ’13 Banzai is that it has the biggest outhaul range of any of our wave sails, so with light outhaul you can make the sail pull like a tractor, and with 3-4 cm of positive outhaul you can make it feel really flexible and neutral. Interesting that you mention the 4.9, because that was probably my favorite size of the 2012 bunch (followed by 4.6 and 5.3). I still carry one myself because the extreme lightness and lift that sail provides in lighter wind conditions. I’ve recommended the ’12 4.9 Banzai about 3 times in the last 2 weeks actually…. Question:I tried to put a little more tenxsion on the 2nd batten (counting down from the top) but nothing happened. I also put a little more tension to the 2 lower battens as Fransisco proposed but nothing also happened. Any way I devoted a windsurfing day, having the batten key with me inside the water and tried every possible combination and still nothing. I took the sail to Stephanos Aslanidis and Ioannou and we rigged it together. The sail looks perfect on the floor and when you are holding it up outside the water. the wrinkles appear only in when you ride the sail. The are all beginning from the end of the two middle battens and travel inside the sail with an angle of 45 degrees. Maybe it is only the twist but i would still like your opinion on the issue. I have also rigged the 4.3 sail but it has not been windy enough to try it in the water to see any deference. You really make a difference. Answer:Hi Vangelis- These are normal twist wrinkles, and they are supposed to be there. Things are working as they should! Batten tension will eliminate unwanted body panel wrinkles in the sail, but when the sail is active and loaded, these diagonal wrinkles you describe are correct and in fact they are evidence that the sail body is twisting as it is designed to. Twist gives the sail it’s handling characteristic- full down low for power- more open and flatter up top for control and range. Question: By the way… been using the 2013 Banzai. A VERY DIFFERENT SAIL. You can tell Braw has his mark on it. I initially had mixed feelings… I felt that it had too much power for me, pitching me forward a lot. Kazuko too. She’d been struggling. But just yesterday (when you saw me), I cranked the downhaul to spec until the leach was crinkled to the marker and what a difference that made. I had a fun day out there and really for the first time I felt good about the sail. What else can I do to make the sail less grunty? More than ever, I feel I can with confidence go a number or even two smaller than before. There is more outhaul range in these sails than 2012. Try that and let me know how it goes! Thanks for your work in making such great gear. Question: Last year you recomended to sail Qd 84 with Banzai 4,9, due to the unique early planning high pressure point. Now I have got the new Banzai 5.0. Answer: 2013 Banzai 5.0 + 84ltr Goya Thruster = Excellent combination! Banzai 2013 (your 5.0) is a different sail than Banzai 2012. Banzai 2013 has more emphasis on overall range- still excellent low end power (like 2012) but a massively increased high wind control and overall range. The power delivery in the new Banzai is lower, more forward and locked which is how the high wind control of the sail has improved so much. This pairs with a thruster set up very well, nicely matching the quickness, drive and maneuverability you will find in that board. Question: Thanks for all the info,I think for 5.3 Banzai [my low end sail]I need a softer Mast [since I am relatively light] in order to pump better and get a bit more back hand pressure[softer bottom section;] that i need in Low winds. This will decrease the range of my sail I think ,but my priority is just to accelerate and claim waves [from kiters…;and other wave sailors] . I would recommend trying 430 bottom/400 top first. This will give you a mast length of 415. The luff length on 5.3 Banzai 437 = 22cm of extension. This will give a little more openness in the head section of the sail which will lighten the feelings in the hands, and also I believe, improve the pumping characteristics of the sail as well, for someone of your weight. The problem with 400 bottom/430 top is it will close the head of the sails and then soften the bottom section of the sail- in my experience, that combo never felt good- the sail starts to feel top heavy because the head is too tight, and the bottom section of the sail feels unstable because the mast is too soft. My recommendation for lightening the feeling of the 5.0 is to increase the outhaul. There really is a big range of outhaul on these sails- in particular the mid 4m+ sizes. Increased outhaul will flatten out the transitional area (between the full bottom and open head) of the sail and induce more flex in to that area. It’s also important to make sure your lower two battens are nice and tight to drive the profile in to the sail body- this increases the quick feeling and draft stability a lot in the sails. The upper battens should also be tightened, but not so much as to create an “s” bend in he sail profile. Glad to hear the 4.2 is working well for you! Question: My quiver is Guru 4.2, Eclipse 4,7, 5,3, 5,7. I am using 4,2 only in hi wind and not for waves. I do waveriding in Mauricius in lo wind with 4,7 to 5,7 sails so i travel without 4,2. We were talking on Maui in 2009 and you suggested me Guru for hi wind and 4,7 eclipse and the compo is superb only i am lacking some power from guru when the wind is gusty. I have 200 lbs and i am using 4,2 only in winds around 40 knotts and more. I would like to take either eclipse 4,2 or banzai 4,2. Will banzai work better than eclipse in stronger winds with more emphazis on comfortable ride and jumping than wavesailing? sails are so light and responsive and powerful. to beat the stability of a 5 batten sail. effortless and responsive handling characteristic. So, for the smallest size the choice is up to you. control, and that’s where the 5 batten 3.7 models come in to play. 4 batten sail should be available around the end summer. Question: It has been a while and I hope you and your family are well! I saw your email to Arnout and I was wondering about your take on the Banzai’s for me in the larger sizes. My biggest sail for 2011 is the Eclipse 5.3 which is a lite wind machine for me. The thought of using smaller sails sounds awesome and I was unable to really pick Francisco’s mind on them at the comp. I am trying to get my order together for the 2012 and I would really appreciate any advice you can give me. Everything you told us last spring was dead on accurate! The masts and sails rule . Answer: the Banzai is a very interesting, and very different sail, so it’s worth taking a moment to really have a look and see how it might fit for you. What could be really interesting in the first year is to stick with your current model line up for 2012, but then consider getting one of the key sizes of Banzai and seeing how it fits in with your boards, conditions, and style. For you I would say 4.6. That’s a sail that will work well in lighter wind for you- if you pair it with a not too small board. Levi says that 4.6 is the biggest size he needs for wave sailing. I use 4.6 when I would normally use a 5.0. I switch quickly to 4.3 when it gets to be “powered 4.5-4.7” conditions. Question: Apparently the largest size available is a 4.9 Banzai and I was wondering if that be equal to a 5.7 Eclipse on a 95L Quatro Quad? I’d love to go as small a sail as possible, but not sure if the 4.9 will cut it for me. Even though I am 210lbs, I am an efficient sailor; often on the same sail size as lighter guys (say ~170-180lbs guys). The 5.7 2011 eclipse (monofilm version) I have now gets me going in mid teens (mph) winds. Too bad I didn’t get a change to try the sail last weekend, but I am sure you have a good idea if it will work for me or not. Also, would you think going all Banzai will work for me, or is the Eclipse Mono a more appropriate sail for me here in the Bay Area. Reading the 2012 brochure, it sounds like the 2012 sails are even lighter and more powerful than the 2011s??? Maybe do a 4.9 Banzai and then 5.0/4.5/4.0 Eclipse Mono?! Answer: Basically with the Banzai sail- IF you have enough volume under your feet, then the Banzai power equals that of an Eclipse or Guru that is .5 meters larger. There is no way the Banzai 4.9 will replace the power of an Eclipse 5.7 for you. But not to worry, the new Eclipse is a nice improvement over last year’s sail. The construction is lighter, and the cut is a little different in that there is more lower leech release- this will help give the sails a lighter feeling, and an overall better better handling and high end speed. The power level from 2011 to 2012 is not more, but is refined to create a lighter feeling better handling sail. Stay tuned on that one, because as I work out those larger sizes, bigger guys like you will be top of the list for testing…!!! I definitely think that the 5 batten sails provide a more wing-like, “lifty” jumping experience. The 5 batten sails drive more forward in the air, and feel very stable. But, the Banzai is so light that it is quick to respond to directional changes (looping) in jumps. It’s not just for advanced riders. I discovered in my last days of testing before I left for China that the sail is an excellent choice for lightweight sailors, particularly women- it is so light and easy to handle, and if the lady has a good floaty fast board, she can really enjoy the benefits of this super lightweight rig plus reduced sail size. Question: The new 2012 looks stunning, simple and nice. Just needs a little help to position the Banzai in relation to Guru and Eclipse. In my mind I have Guru as very controleable high wind sail, easy to depower, fast. Not so good at early planning and cross on conditions Eclipse is power wave sail, with early planning and good with cross on conditions. A very attractive euro wave sail. Not so good at speed and controle in owerpowered conditions. So now to – where is Banzai better than Guru / Eclipse and where is it less recomended? Answer: Thanks for your mail and inquiry. GURU is a quickly neutral sail, that’s for sure, but the sail also has a a good low end punch. Also, I never really classify the sails according to conditions, but rather by the feeling and power delivery you are looking for in any given condition. GURU works well in onshore conditions, if you like a quickly neutral, flexible feeling sail. Alternatively, ECLIPSE is a great sail for cross offshore down the line wave riding if your preference is a quick and direct feeling sail. Currently the size range is 3.3, 3.6, 3.9, 4.3, 4.6, 4.9. The spacing between sizes is larger than standard because the range of the sail is larger than standard. That larger range inhabits the low end performance of the sail. This 4 batten sail is meant to be used about .5 smaller than you would normally choose in models Guru and Eclipse. For example 4.9 replaces 5.3, 4.6 replaces 5.0, 4.3 replaces 4.5/(4.7). ***These sails are NOT meant to be used over powered. If it gets windier, you size down. ***These 4 batten sails are best paired with a modern, high volume board that gets moving quickly. This 4 batten sail features an aspect ratio very similar to the 5 batten sails (the 4 batten 4.6 is 162/413), but considering that you use a size smaller than a 5 batten sail, you end up with the benefit of the shorter boom and luff comparatively. I don’t believe that 4 batten sails should be too short in the luff dimension. If you shorten the height too much, then you are forced to extend the boom, the leech outline, or both. A square meter is a square meter after all, no matter how you draw it. By minimizing the trailing outline of the sail the 4 batten maintains a very quiet feeling in the hands at all points of sail. The power delivery of this sail is smooth and accelerating, and the feeling is a comfortable combination of direct and flexible. Our 5 batten models GURU and ECLIPSE are a better choice for sailors looking for more high end range, and a lower locked and forward driving power delivery. ECLIPSE 2012 will still be a full power direct wave sail, but with a lighter, stronger construction, combined with a more forward driving, light feeling handling characteristic. GURU 2012 also will be lighter and stronger. GURU 2012 will have great low end power and improved maneuverability in wave riding and transitions due to increased lower leech twist and a modified foot outline. I hope this info helps Lars! The development of Banzai has really happened in tandem with the board development- the new style floaty, fast and loose boards really create a lot of opportunity to re-think the way the sail delivers it’s power and also how the sail can handle throughout a wide wind range. Banzai for sure 4.9 and/or 4.6 to start, see how you like them and then you will know what you need. Keith and Pascal only ride 4.3 and 3.9 and they use to ride 4.7 to 4.2 so a safe bet is about .5 mts down. What I can tell you is that they offer a much larger power zone on the sail, making them super efficient in the light air turning slogging conditions into fun & planning with something light on your hands AND one of the biggest differences you will feel is the reduced pressure in the mast track on your board, that to me is the reason so many people are loving it, it basically frees up their noses, rails as if they were surfing without a sail. Considering what you’ve told me, I think you should have a 4.9 for sure. It’s such a great light wind motor sail. As you get down in to the smaller sizes of Banzai, they still have excellent power, but you will find excellent top end control as well. One reason for this- and the reason that the larger sizes feel light- is that I don’t let the sails get too short because a short sail is a roach sail (lots of leech outline) and roach sails tend to feel heavier, and be more difficult to control in the high end of their wind range. The Banzai is probably the tallest 4 batten sail on the market, and that height creates a nicer, lighter feeling outline. So the sails have a great low end power- as you’ve experienced- and great high end control as well due to the outline as well as the carbon finer stretch control and lightweight construction. That’s why the spacing on the Banzai sizes are farther apart- they have more range. I think a Banzai 3.6 would compare well with your current 3.7. So- I would say- 3.6, 4.3, 4.6 and 4.9. Corey wrote in with this question. He usually rides Guru and loves it. IF you have enough board volume, the Banzai sail’s power compares to a 5 batten sail (guru or eclipse) of about .3 or so higher. So, 4.6 replaces 5.0 and 4.9 replaces 5.3- if, and I can’t stress this enough- if you have a quick board. he Banzai isn’t meant to power up a sticky board. The profile of Banzai is flatter, but more engaged overall, so the pull comes from slightly higher and more back than a 5 batten sail. The feeling of Banzai is soft because it is all scrim (and a huge 7 mil monofilm window- great for down the line visibility) but it’s a different kind of softness than guru- it’s soft but still really quick and lively. The guru tends to have just a touch more delay. My recommendation is to just start with 1 or two key sizes of Banzai and see how they go for you- maybe start with a 4.3 for strong wind and a 4.9 for light wind. After trying those sizes I’m sure you will be able to tell how the sail fits in for you. The construction of the Banzai is super lightweight, but I tell you man, the boys just beat those sails all winter on Maui, in the marshall islands, and except for major explosions on the rocks or something like that, they just didn’t really break. I was very surprised how tough they are.